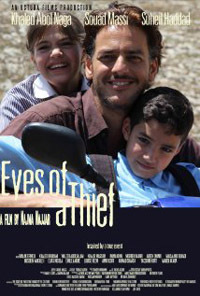 Eyes of a Thief had its world premiere at the Ramallah Cultural Palace in Ramallah, Palestine. Developed thanks to a grant from the Doha Film Institute, it has travelled to several festivals, notably the Cairo International Film Festival where the leading actor, Khaled Abol Naga (an Egyptian actor) was awarded the Best Actor award. With an intricate plot, Najwa has created a psychological thriller that is multilayered and at once a family story, a love story, a look at social conditions in a territory under occupation, all with the intent of confronting audiences with the fine line differentiating resistance from terrorism. The film was Palestine's official submission for the Best Foreign Language Film at the Academy Awards 2015.